Most of my time in South Africa thus far has been spent along the North Eastern side of the country, this week (May 11 – May 17) I decided to shake things up a bit and hop on a plane to Cape Town- the very Southern most region of South Africa. 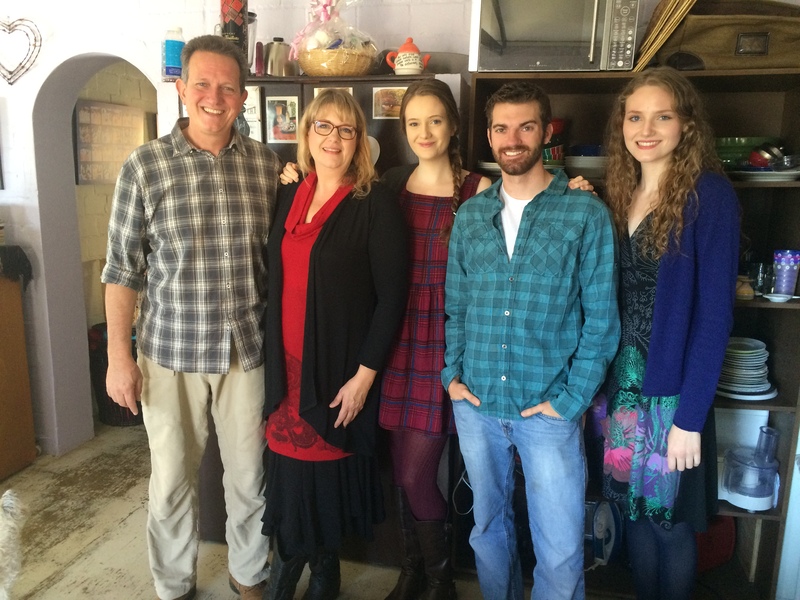 I stayed with another wonderful family (The Havermann’s) who took me in as one of their own. Tuesday the 12th- A few of us hiked up a famous trail called Table Mountain, which of course was spectacular. It took just a few hours to reach the summit, once we reached the top we scouted around for a bit and then took the cable car down. View from the top of Table Mountain! On the hike up- early morning sunrise. Spotted the closest known relative of the Elephant- called a Dussie. Wednesday the 13th- Tamaron and I got dropped off near Donny’s work (elementary school- in the coastal town of Kalk Bay) and then met up with one of Tamaron’s friends, Kirsten, for our day of sightseeing around town. First we walked up Jacob’s ladder- a really long, steep set of stairs that took us through a beautiful residential area. Then we came down along the beach coast and stopped at a little café called Olympia Bakery for a light breakfast- their chocolate croissants were to die for! Afterwards we continued to walk back along the coast stopping at a few art museums and shops along the way. We ate lunch at a place called Cape to Cuba, before walking to the harbor to see the seals playing on the docks and folks fishing off the pier. Thursday the 14th- In short, today was EPIC. I hitched a car ride over to a little fisherman’s town called Gansbaai (pronounced: Hans-Bay) about 2 hours East of Cape Town. The beaches of Gansbaii are world renowned for being the #1 spot in the world to see Great White Sharks. Today I arranged to go cage diving with hopes of seeing these magnificent (and often misunderstood) creatures. As luck would have it, the month of May was peak season for sharks in the area. Also, during the month of May, the Great Whites are known for displaying predatory breaches- the ones you see on shark week where the entire shark launches out of the water as it attacks it’s prey! Needless to say I was stoked. We arrived at the dock, had a quick safety briefing which consisted of “don’t put your hands, feet, or any other body part outside of the cage” and then we climbed aboard the boat with about 15 others. It took only 10 minutes before spotting our first shark- it was massive. We dumped the 5 man cage overboard and a few of us climbed inside- myself included. The emotions that overcame me in the next couple of minutes can only be described as sheer excitement, fear, panic, and amazement (in that order) as a 15 foot great white gracefully swam within mere inches of the cage. The water was a cool 43 degrees and had a murky green tint. One second you would see nothing but greenish blue ocean, and the next minute you’d see the head of a great white appear out of the abyss right in front of you! We all took turns rotating in and out of the cage, with about 15 minutes each turn. At one point we had 6 different great whites circling our cage, needless to say I think we all had our fill of sharks for awhile. Friday the 15th- After yesterday’s excitement, I felt like I needed to slow my roll a little- so Bryan drove us (Tamaron, Kirsten, and I) to the Kirstenbaush Botanical Gardens. We walked around for a few hours and took in all the sights, sounds, and smells. The “Boomslang walk” was really beautiful- It was a winding bridge that was suspended high above the garden floor. We also took a stab at walking along the “Braille Trail” that was build for the blind/seeing impaired. We closed our eyes and felt the guide rope slip through our hands as it led through the park for about 15 minutes. Several bumps and bruises later we arrived at the end of the trail and finally opened our eyes. It made us all appreciate our eyesight as what what laid before us was a plethora of wild flowers, vines, and exotic trees. Saturday the 16th- Today was my last full day in Cape Town, so we tried to do all the little things that I hadn’t got to do in days previous. Most of the day was spent hanging out with the African Penguin Colony at Boulders Beach and traveling to Cape Point- the very Southern tip of the entire continent. “Smile and wave boys, smile and wave”. Wish I could take him with me! Sunday the 17th- Today was bittersweet, I had to say goodbye to the Havermann’s and make my way back North to Durban. On the other hand I was anxious to meet my cousin Nick, also from Colorado, at the airport that evening. He would be joining me for the rest of the adventure.